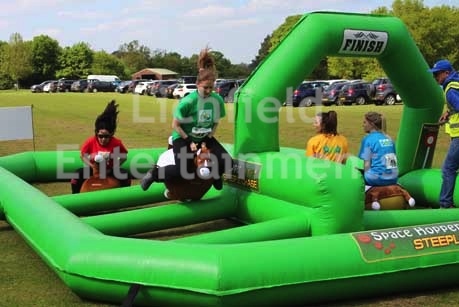 Hold your very own Grand National Steeple Chase with our great space hopper horse racing inflatable. Suitable for 2-4 players at a time the participants have to complete a set number of laps bouncing around the track and over the inflatable hurdles on their horsey space hoppers. Suitable for both kids and adults and perfect for fun days and team building events. Hopper Horse Racing can be hired with or without staff to organise the races. The inflatable requires an overall operating area of 25x20ft. Subject to minimum orders we offer our hire throughout the Midlands and much of the UK including Birmingham and the Midlands, Buckinghamshire, Cheshire, Derbyshire, Gloucestershire, Herefordshire, Hertfordshire, Leicestershire, London, Northants, Nottinghamshire, Oxfordshire, Shropshire, Staffordshire, Warwickshire, Worcestershire, Yorkshire. If you have any queries, questions, or would like to book the Hopper Horse Racing for your event please call us on the number below or click to enquire and we will do all we can to help.